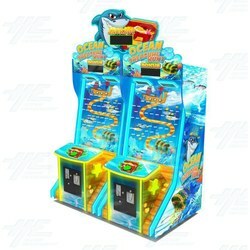 Ocean Treasure Hunt is a timed ticket redemption machine which gives players the opportunity to aim directly for the big ticket BONUS at the bottom each and every time! Moving needles jam the dropping ball, and players must hit the button at the right time in order to release the ball from the swirl track to drop into the bottom of the tickets box. Players can enter the bonus treasure box playfield in order to win extra tickets!